Iraqi security forces have recaptured Mosul airport, a key part of the government's offensive to drive the so-called Islamic State (IS) from the western half of the city. The operation took four hours. IS continued to fire mortars at the airport from further inside the city after losing the ground to the army. The jihadists have also entered a nearby military base amid further clashes, a military spokesman said. Thursday's advance brings the army within less than a mile (1.6km) of western Mosul, where the militants are expected to launch attacks from densely populated neighbourhoods. After darkness fell, government armour could be seen lining up for a new move forward, the BBC's Quentin Sommerville reports from the scene. Thursday's assault began with air strikes by the US-led coalition before armoured columns advanced to the airport's perimeter. 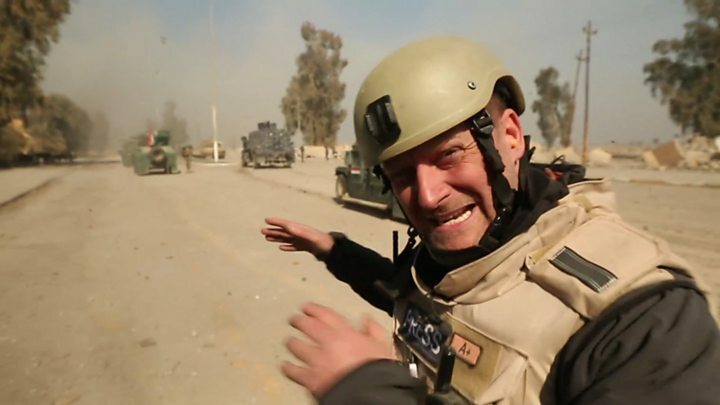 An Iraqi lieutenant was killed by one of the roadside bombs planted in the area by IS, the BBC has learned. Iraqi forces also came under fire from IS militants holed up inside airport buildings, reports said. Foreign troops from the US-led coalition were with the attacking troops, officials told the Associated Press news agency, without specifying their nationality. The airport's runway has been destroyed by IS but our correspondent, who is embedded with Iraqi federal police units, says it still has value. It is a large piece of land and controlling it will help secure southern routes to west Mosul, our correspondent says. The airport and the al-Ghazlani base are on Mosul's southern outskirts on the western side of the Tigris river. Thousands of Iraqi troops, backed by artillery and air power, are involved in the assault to retake Mosul. Leaflets warning residents of an imminent offensive were earlier dropped over western Mosul, where military officials say narrow winding streets could make retaking the area particularly difficult. Although slightly smaller than the east, western Mosul is more densely populated and includes districts seen as pro-IS. The UN has voiced concern about the welfare of civilians trapped in the city. Aram Shakaram, the country deputy director for Save the Children in Iraq, told the BBC he believed relatively few people had been able to escape the city since Wednesday. He said the charity believed that nearly 800,000 people were still trapped there. We are very scared, and we are worried that the final stages are going to take long. S will not give up and withdraw that easily and the whole operation might take as long as it did in east Mosul. I won't lie, I am scared too and I don't know if I am going to die in an air strike or killed by an IS fighter. More than 160,000 people have fled their homes in and around the city. All bridges linking the east and west of the city, across the Tigris river, have been destroyed by air strikes. IS jihadists overran Mosul as they spread across much of northern and western Iraq in 2014.